“The Albany Public Library is more than its seven branches and collections, it is a place to interact with people and learn new things. The Albany Public Library Foundation had a great year in 2018. Thanks to your past contributions to the APL Foundation’s Annual Appeal we were able to do so much to fund innovation at the Albany Public Library. Donate today so we can do even more next year! 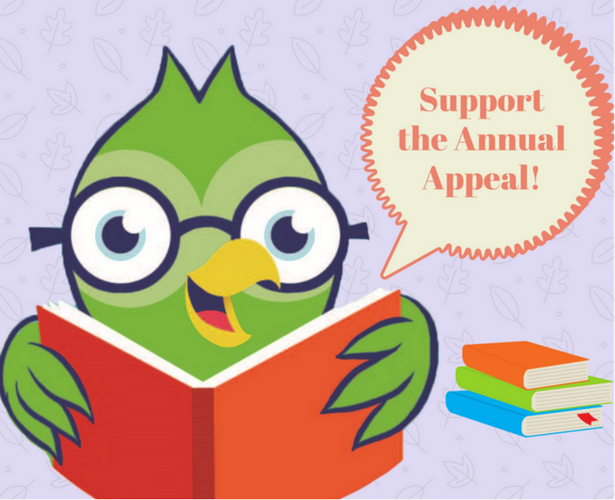 Help us to reach our goal of $20,000 for the the 2018-19 Annual Appeal! This will be the last Annual Appeal from an organization called the Albany Public Library Foundation: The APL Foundation and Friends of APL will be merging in 2019: The unified Friends and Foundation of APL will work even harder to help the Albany Public Library expand literacy, develop careers, and provide lifelong learning for everyone in Albany. And, we will work smarter too. This year, the APL Foundation started an Internal Grant Program to distribute mini-grants for programs proposed by library staff. Through this new program, your Annual Appeal gifts have supported Ceramics Classes at Arbor Hill, the very popular Teen Chef program at Delaware, Djembe Drumming Classes at Howe, and a panel discussion about teens and the media at Washington Ave. We hope you are excited as we are about the Internal Grant Program. The new Friends and Foundation of APL will continue to celebrate local authors while raising money for APL at the Literary Legends gala. Our 5th Annual Literary Legends gala honored authors Dr. Frankie Y. Bailey and Dr. Alice P. Green at the Howe Branch. We partnered with Schuyler Mansion and the evening was magical. We raised nearly $25,000 at this year’s gala. We also added a new Community Partner Award to the Gala, celebrating an outstanding partner of the Albany Public Library. This first award went to YouthFX, honoring four years of the Youth FX@APL program. Our 2019 gala will be at the Washington Avenue branch and will be our biggest and best ever gala! Public libraries are more important than ever. That’s why we are Funding Innovation at Albany Public Library. Please join us and give today to the Annual Appeal!